Our large skip hire solutions are the most capable and sturdy making them ideal for the larger scale clearances and contractual site work. Our Large Skips are available with several options including open, closed and drop end and have a maximum capacity of 80 refuse bags. This makes them suited for larger construction and clearance jobs. 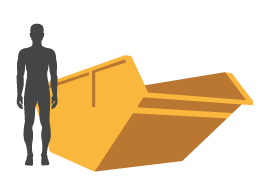 The size of the skips offered by Aasvogel varies, but our team of specialists are always available to offer help and advice so why not call us on 01235 760555 to make your decision easier.